Television has become a cultural phenomenon in the United States. In fact, next to the family, some experts believe that television can be the most influential medium to children. Even young infants and toddlers are becoming mesmerized by popular television shows marketed to their age group as "educational" programming. But are our babies really ready? As the scientific community continues to study how babies and young children grow and develop, the issue of television watching becomes even more complex. Parents struggle every day to find the right answers in an age where television and technology become more and more prevalent in our society. The need to weigh the pros and cons of children's involvement in the medium has become increasingly important. The American Academy of Pediatrics (AAP) recommends that parents not allow their children under 2 to watch television. That's because there is a critical window of opportunity for brain growth found to occur during the first three years of a child's life. During this time children need good, positive involvement with other children and adults, as well as ample time to play and explore. 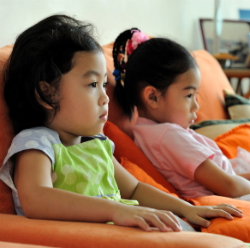 Television watching, experts say, is a passive activity that can deprive children of the active, responsive and communicative environment in which they thrive. "The AAP wants parents to realize that interactive learning and positive reinforcement is the way babies learn best," says Susan L. Buttross, M.D., a member of the AAP Committee on Public Education and chief of developmental and behavioral pediatrics at the University of Mississippi Medical Center in Jackson, Miss. "During the first years of life, a baby's brain grows very rapidly. During this time it is important for a child to have immediate reinforcement when a new word or skill begins to develop. Parents can help to foster appropriate development through interactive play," she says. "If parents are looking for a way to take a break, they should remember that you can place a child in a safe area with blocks, puzzles and books and he will benefit much more from the visual and tactile stimulation of the activity. Babies can be 'media free' and develop wonderfully." The suggestion to delay exposing children to television was also motivated by the growing concern over the amount of television U.S. children are watching these days. According to reports published by the AAP, school-aged children are watching as much as 4 to 6 hours of television a day. This figure does not include time spent watching movies, listening to music or watching music videos, playing video or computer games or surfing the Internet for recreational purposes. "What we know and understand about young children is that their intellectual, cognitive, social and emotional development all occurs in the context of relationships," says George Askew, M.D., a pediatrician at Boston Medical Center. "Television is a passive activity that does not provide two-way interaction or response, both of which are critical to young children," says Dr. Askew. "In order to learn nuances of language, how to relate to others and to develop social skills, there must be an active give and take. I believe that the day-to-day, moment-to-moment connections with a responsive, nurturing, committed caregiver are far more enriching to a child's growth and development than any brand of media." Another factor concerning the issue of toddlers and television involves the increasing problem of obesity. Children who spend time watching TV instead of running, jumping and playing are much more likely to be overweight. Not only are they saturated with commercials generally promoting unhealthy, sugary and fatty foods, but they also tend to snack more while watching TV than they would otherwise. The reality of today's world makes many parents flinch at the recommendation of not allowing television for children under 2. Factors such as older siblings, busy work schedules and exhausted stay-at-home moms and dads, make the ideal television-free environment seem a little unrealistic. Even amid the scientific data and expert recommendations, most parents' attitudes about television are driven by their own experiences and reflect their parenting values. Experts agree that television watching is ingrained in our everyday lives. But, they say that it's not merely a matter of watching television or not watching television, but how much and to what type of programs children are exposed. And most important, are parents taking the time to watch with their children? "There are many talented people developing great programs that can help parents and teachers help their children learn," says Alan Simpson, with the National Association for the Education of Young Children, the nation's largest organization of early childhood educators dedicated to improving the quality of programs for children from birth through third grade. "Children are learning from birth, and anything that piques their curiosity can help them learn new things. If there is a program or video with quality music, colorful images and good ideas, and a parent watches and interacts with the child during the program, then it can be a positive experience," he says. The "harm" can come, warns Mr. Simpson, when parents think that the television can be a substitute for human interaction. "Television, like any other technology, is a tool," he says. "It can be used wisely, or unwisely. There is always a concern when children are left unattended with a television, especially at such a young age when they really need ongoing exchanges with other people. They need to be responsive and to learn from other people's responses to them. Television just cannot fulfill those needs." Diane Levin, Ph.D., professor of education at Wheelock College in Boston, Mass., studies the on-going effects of media on young children and authored the book, "Remote Control Childhood? Combating the Hazards of Media Culture." Dr. Levin says that even though placing a child under the age of 2 in front of the TV for a short time may not result in irreparable harm, she emphasizes the fact that there are many other better things they could and should be doing with their time. "Young children are very vulnerable. They do not have the cognitive skills to understand and make connections with what they see on television," says Dr. Levin. "They have to explore their world in order to make sense of how it works. They need experiences that help them to develop creativity, master their own skills, and learn that they can control their own environment. And they do this through play and self-discovery." Television, says Dr. Levin, can rarely substitute for this kind of experience, and it can even undermine children's desire and ability to initiate quality interaction with their environment. "Even from a young age children can begin to rely on television images and messages to dictate their agenda if viewing becomes a ritual for them," she says. Also, the more parents use media as a babysitter, explains Dr. Levin, the more they will need to use it because it creates a habit cycle that is difficult to break. There have been numerous studies and reports on the effects of TV on children. Becoming more knowledgeable about the subject makes it easier for parents to make decisions regarding television viewing that work for their children and families, says Dr. Levin. Information can be obtained via the Internet and at local libraries. There are also organizations such as the Coalition for Quality Children's Media (www.cqcm.org) and PBS guides that can help parents determine appropriate programming options. "Parents should reach out to their pediatricians and child care providers for advice on television viewing," adds Dr. Levin. "They should also talk to the parents of their children's friends for new and different perspectives and to work out common approaches for dealing with the TV issue." Limit television time each day. the American Academy of Pediatrics recommends that parents should limit children's viewing to one to two hours a day. Young children need opportunities to do many activities throughout the day. Watch television with your child. Studies show that television is most beneficial for children when a parent or another adult watches with them. Participate along with your child. Sing or repeat rhymes with your child during the program. Your participation will indicate to your child that you care and are interested in their interests. Talk about what you've watched with your child. Spend time talking about what happened on the program, both positive and negative behaviors/actions. Do follow-up activities. Repeat some of the pretend play, activities and songs after the show is over. This reinforces the concepts presented.